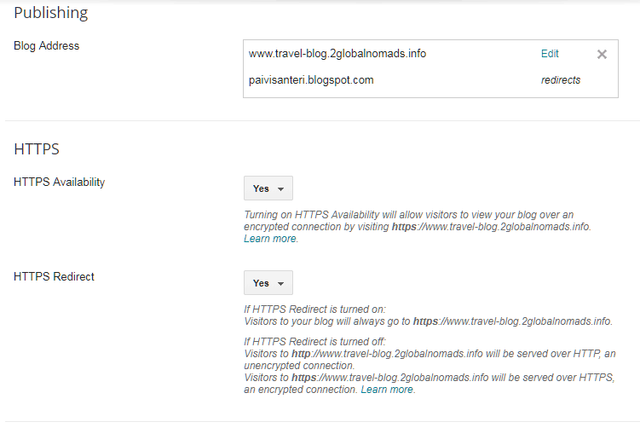 How To Migrate From HTTP To HTTPS On Blogger Blog With Custom Domains? 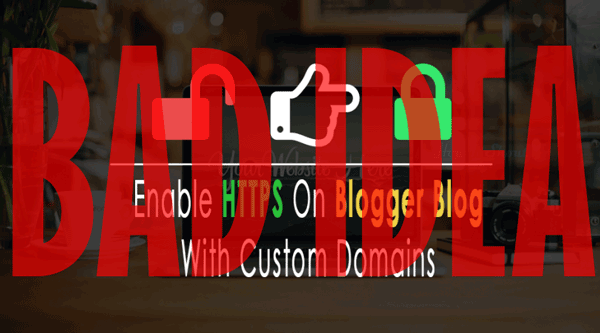 Finally, the trick is revealed to enable the HTTPS SSL certificates on your Blogger blog using a custom domain, we have a trick to get free SSL certificates. Too good to be true? Absolutely. Whenever you see SEO and India in the same sentence, think twice. your blog’s ranking in Google and other search engines will improve. Thanks to these "improvements", search engines will endlessly redirect from http to https because of the broken sitemap and eventually the blog will be excluded. Thanks to the missing meta tags sharing posts in social media works no longer either. Such setbacks outweigh all the claimed benefits. The funny thing is that those SEO experts keep scraping defunct instructions from each other trying to sell their expert services for making the migration, and for fixing your blog after you have messed it up by following their instructions. I was considering to do that but not anymore. It's very bad idea. Only Google can fix blogger to support https properly with custom domains. P.S. Don't bother posting any critical questions or comments to their websites as they will be censored. Last edited by Santeri on Sun Sep 03, 2017 6:51 am, edited 1 time in total. Today I saw one more scraped blog convincing people to mess up their blogs promising SSL support for custom domains in Google Blogger. All of the following people are distributing knowingly defunct hacks. I have left a comment telling that to each blog. These Indian guys keep encouraging people to break their blogs hoping to sell them consultation to fix the problem they caused. According to the blog comments, dozens of bloggers have successfully broken their blogs some of them suffering financial losses. Please let me know if you find others and I will add them to this hall of shame. Once more: Google BLOGGER DOES NOT SUPPORT SSL FOR CUSTOM DOMAINS and it is not possible to make it by yourself. Ask Google to make it if you want it, they are the only one who can make it. Google has finally made https support for blogger and it works! They use the free letsencrypt certs. If you enable https for your custom domain name from HTTPS Availability, wait until it actually starts working. There can be a delay of a few hours before HTTPS starts to work. Test that the HTTPS really has started to work before enabling HTTPS Redirect.